I took my mobile phone and walked around my house looking for the oldest object in the house. I opened my wardrobe and saw a vest with holes that I wore during my school days. It was old. But it was not the oldest. Then I walked into the living room and wanted to click that old gramophone. It was a 1964 make instrument. But I knew there should be some other object which was older than that. I then saw an old photograph of my great great grand father which must have been clicked by the Britishers for whom he worked. It must have been taken in the 1910s. When I started discovering things that date back to more than 100 years, I decided to search more to find if I could find any other object which was older than that. Finally I saw this chair, which has plastic seat and backrest. The frame was varnished some years ago. The chair is made of teak wood and that chair dates back to the 1890s. It was a love gift presented by my great grand father's great grand father to his wife. That chair has seen 3 centuries, 8 generations and many people. 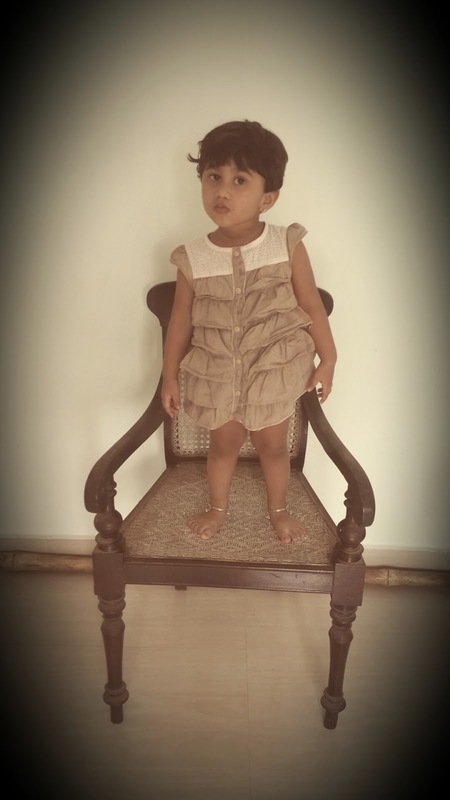 I asked my daughter to climb the chair and clicked this snap. I strongly urge my blog friends to click a picture of the oldest object in their house and write a blog post about it.